A double spiral drop Pendant Necklace in 9ct Gold with a sparkling glitter finish. Strung on a fine gold chain, the freely moving Pendant twirls and dances as you do. 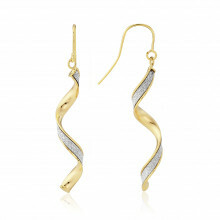 Perfect for parties and dressed up occasions or to add some subtle sparkle to your everyday style.